Bridge Road Brewers has always been keen to serve up a slice of education with its beers. Over its decade and more in brewing, there have been releases such as the Single Hop Series showcasing many of the country's hop varieties (with other experimental varieties highlighted in the annual Harvest Ale beers before everyone else started releasing them), a Variety Pack and an IPA Pack. And now, with Christmas approaching, updates on two of them are out and about. The Variety Pack has become Beer 101 and risen from a pack containing four of the Beechworth team's core range beers to one featuring six. They range from the entry level Golden Ale via flagship Beechworth Pale Ale to Bling IPA, with the reworked and recently trophy-winning Robust Porter plus Chestnut Pilsner and Celtic Red Ale completing the picture. You'll find a guide to the brewing process and other beer basics on the pack too. The IPA Pack is back as an IPA Experience Pack, bearing similar comic like artwork but offering more than a chance for Spiegelau to showcase their IPA glass. 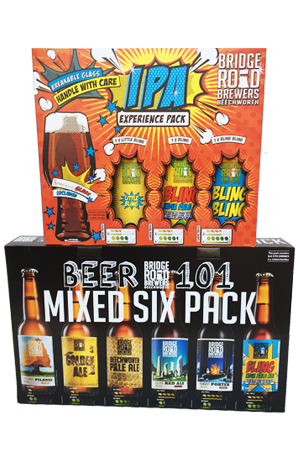 The original packs contained three (differently coloured) bottles of Bling and a glass; this time around you get the Little Bling mid-strength IPA and Bling Bling imperial IPA either side of the original Bling, allowing drinkers to experience three variants of the style rather than just the same one three times.